Today we Bee’s buzzed by the Soyosan Mountain located on the outskirts of Dongducheon City. The term Soyosan means, “walking” and walking is what we did! This mountain is relatively small standing 587m tall but boast lush forest, hiking paths, stone bridges, Korean style restaurants/ Inn’s, waterfalls, Caves, and Jajaeam (small Buddhist temple). Don’t let the size statement fool you because this mountain can be steep and narrow at times on the way up. We started to refer to the Korean hikers as billy goats because no matter what the age they just keep passing you effortlessly. Non- Dongducheon visitors must pay an admission fee of 1,000 won. This fee helps to preserve and maintain Soyosans upkeep. Unlike the states we quickly took notice that there is no litter on the ground, no graffiti to be found anywhere, all of the flower beds and paths are weeded nicely, restrooms are kept up with, and they provide high pressure air machines to blow the dirt off the bottom of your hiking boots or shoes. On the mountain we meet a little Korean boy hiking with his family who was very very eager to tell us An-nyung-ha-se-yo, a formal hello in Korean, that he kept saying it repeatedly awaiting for our responses. We also had the chance to meet two great new American friends that are teaching English in the area at one of the International public schools. We wanted to say thank you again for taking our picture for our blog! We look forward to bumping into them again too! Larry bought me a wooden prayer bead bracelet at a vendor near the buddhist temple to remember our trip. The vendor stand had prayer candles for purchase, various wooden prayer bead bracelets, necklaces, and cast iron stones to write prayers on. 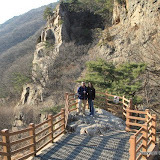 Stay tuned for more pictures, as we are planning another trip back to Soyosan with friends to picnic, check out the spring leaves and flowers, and finish hiking our way to the top. Thanks brad! We need to get back out now before the weather changes and gets to hot to enjoy. I bet the views are even better now that spring is here.